I used to not like fall. Heck, I used to not even like Christmas! But as I've gotten older (Shush. I'm only 29) I've grown to love that subtle shift in the temperature. When the dew point drops and the leaves start to turn. Tank tops are layered with cardigans, houses are filled with scents of cinnamon and pumpkin and apples and the delicious wafts of whatever is in the slow cooker for the day. 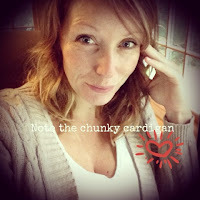 Chunky cardigans are clearly a must. Today is one of those textbook fall Sundays. I have caramel apple cider in a small crock pot on the counter, just waiting to be busted into during the Packer game at noon today. (No recipe... just throw in some apple cider, mulling spices and a couple heaping tablespoons of caramel syrup - we prefer Mrs. Richardson's Butterscotch Caramel - and let it go for a few hours). Dinner tonight shall be the Pioneer Woman's famous Beef Stew with Beer & Paprika. (When I announced this to my husband he may or may not have peed his pants in excitement. What are your fall staple recipes? Share, please! Bonus points for anything that can be thrown in the slow cooker. Now, if you'll excuse me I'm going to go light a cinnamon and clove candle from Bath and Body Works, snuggle up under an afghan and watch reruns of Arrested Development until the Packer game starts.